In my practice and research I explore ways of using new technology in artistic contexts, with an emphasis on the development of interactive software for live performance. My PhD work involved the creation of a number of computer-based musical instruments which used novel interaction strategies to facilitate creative, conversational approaches to music making. Currently, I am co-director of the Creativity and Cognition Studios, an interdisciplinary research group working at the intersection of creativity and technology. I am interested in working with creative artists, performers and technologists who have an interest in further exploring new approaches to creativity and interaction. My approach is very much 'practice based', in that I work with artists to create performance works - rather than working to develop technologies or 'instruments' in isolation. The process of creating these works allows us to explore the interactive possibilities between live performer and computer and to identify successful (and unsuccessful) strategies. The creative work is also a way of exploring creative interaction more broadly - including the creative practices of performers. In other words, while technology and design is a significant component of the research, human creative practice is equally important. Creature: Installation - Highlights from Stalker Theatre on Vimeo. Creature: Installation, premiered at the Queensland Performing Arts Centre, June 2016. 360 Degree Immersive Interactive visuals by Andrew Bluff, Boris Bagatinni and Andrew Johnston. Creature: An Adaptation of Dot and the Kangaroo- Highlights from Stalker Theatre on Vimeo. Creature: An Adaptation of Dot and the Kangaroo, premiered at the Queensland Performing Arts Centre, June 2016. Interactive visuals by Andrew Bluff, Boris Bagatinni and Andrew Johnston. Interactive visuals with Alon Ilsar (AirSticks), Daniel Pliner, Josh Ahern and Andrew Bluff. Creature - Siteworks 4min from Stalker Theatre and Marrugeku on Vimeo. An installation & performance at the Bundanon Trust 'Siteworks' event, October 2014. Andrew Bluff, Andrew Johnston & David Clarkson. Video demoing Speech Invaders and Yak Man, two speech controlled games developed as part of the Creative Vocal Systems for Engaging Speech Therapy project. In collaboration with Linda Walsh (oboe) and Andrew Bluff (interactive system). A performance at the Newcastle Conservatorium on December 12, 2013. Interactive systems developed with Stalker Theatre for presentation at the Gwacheon Festival and Hi Seoul in Korea, September-October 2013. Some highlights from Encoded, a collaboration with Stalker Theatre. Some tests of projection masking, body mounted projectors and interactive point cloud fluid simulation. Phil Slater (trumpet), Jason Noble (clarinet) and I perform at New Interfaces for Musical Expression 2010. Ben Marks (trombone) and I perform an improvisation at the Bon Marche Theatre, University of Technology Sydney, September 2009. An improvised performance by Diana Springford and Jason Noble (clarinets) at the Sound Lounge with software for Partial Reflections III, November 2007. Video by Kraig Grady. A complete live performance of Partial Reflections at the Queensland Conservatorium on May 17, 2007. Sorry about the low light. 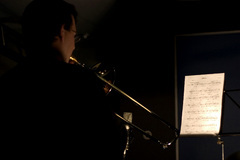 Some photographs of Ben Marks performing Partial Reflections (aka 'Spheres of Influence'), for solo trombone and interactive software.